As part of the default sensor suite, YAF is used to generate flow records. 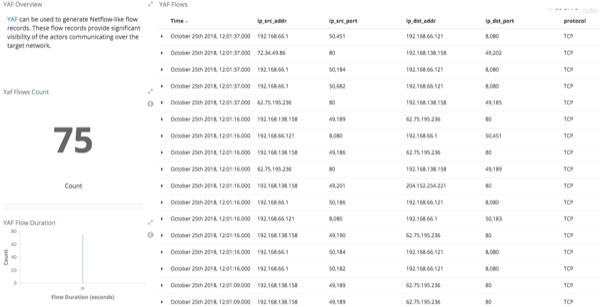 These flow records provide significant visibility into which actors are communicating over the target network. A table panel displays the raw details of each flow record. A histogram of the duration of each flow illustrates that while most flows are relatively short-lived there are a few that are much longer in this example. Creating an index template that defined this field as numeric was required to generate the histogram.